Can you say Disco Ball? As a fairly new member of the IIDM Team, this is my first “real” experience with company culture. Sure most companies have some level of culture, but it usually reflects very little, especially to the employee where it matters most. This disco ball is one representation of our culture and a very evident symbol in our morning “Hoopla”. What better way to start the day than under a disco ball, clapping, getting “FULLY LOADED AMPED UP” (pun intended), and recognizing team members for a job well done. The Hoopla goes well beyond these examples, but hopefully it provides a visual of how our days begin. Our culture is such an important aspect of this company and difficult to fully explain as it is much better when lived! Is this the norm? No, not even close, but it is accepted, anticipated, and without this developed culture, we would just be another company in the automation & controls world pushing products and services in hopes of a sale. We are unique, we are different, we are because we want to be and in my short tenure it shows very well to those who matter most – our customers, manufacturers, and our personnel. Does anyone else have a disco ball in their company meeting room? We have one in both Houston and Carrollton offices. How cool is that? That’s where we gather each morning to bring up the different ways that we helped customers the day prior, our Legendary Customer Service meeting — otherwise known locally as “hoopla”. Each of our associates has a chance to compliment a co-worker each morning. How many offices do that every, single morning? 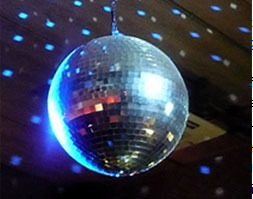 BTW, did you know that a 12-inch disco ball (mirrored ball) runs about $8. At that rate, there is no reason that every home in America shouldn’t own one.